The most common pathway for the introduction of invasive marine species has been vessel biofouling, followed by ballast water. 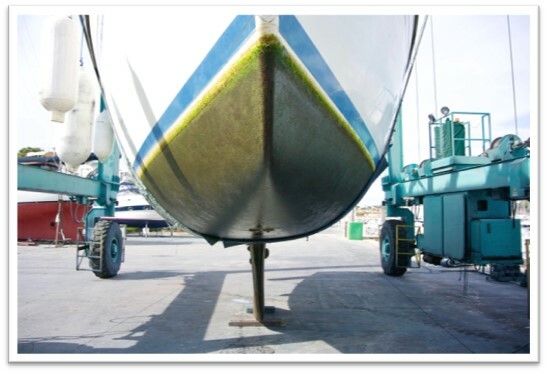 Biofouling is the attachment of organisms to the wetted portions of boats and ships, while ballast water is water taken up or released by a ship to provide stability. This page is a compilation of reports, summaries, and studies focused on addressing these two pathways in Hawaiʻi in order to ensure better protection of our marine ecosystems. During the fourth installment of the HISC Brown Bag presentation series, aquatic invasive species expert Jules Kuo describes new approaches to minimizing the transport of marine invasives to Hawaii. Jules reviews proposed regulatory approaches based on risk assessments for both ballast water discharge and hull fouling organisms. Her presentation also reviews some of the new tools available for safe in-water cleaning of hulls. 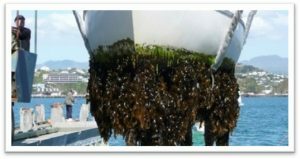 2018 Powerpoint on Biofouling by DLNR-DAR: Jules Kuo, Ballast Water and Biofouling Coordinator for DLNR-DAR, provides an overview of the issue surrounding vessel biofouling and new approaches to minimizing the transport of marine invasives to Hawaii. This presentation was give to member of AAOTF in 2018. 2016 Motion on International Biofouling; IUCN WCC: CGAPS and the University of Hawaii William S. Richardson School of Law ELP have partnered on a Motion for the IUCN 2016 World Conservation Congress to address biofouling. of hulls. 2016 Hawaii In-Water Vessel Cleaning Report Final Report: With funding from the Hau`oli Mau Loa Foundation, CGAPS contracted the Smithsonian Environmental Research Center to conduct a risk/needs assessment on vessel biofouling and in-water vessel hull cleaning, in partnership with the DLNR Division of Aquatic Resources. 2014 Final Report on Hawaii Biofouling: 2014 report from the Smithsonian Environmental Research Center on the risks/needs associated with vessel biofouling and in-water vessel hull cleaning, in partnership with the DLNR Division of Aquatic Resources. Find the interim report here. 2006 CGAPS Alien Algae Final Report to TNC: This report provides a summary of the work accomplished by the Marine Outreach Specialist over 6 months. Funding for this position was provided by the Nature Conservancy of Hawaii. CGAPS VIDA Legal Analysis (updated 2016): CGAPS and partners have been watching the Vessel Incidental Discharge Act (VIDA) for several years in its various forms. In 2016 it was amended into H.R. 4909, the National Defense Authorization Act. Original CGAPS VIDA Legal Analysis (2015): Original legal summary of the Vessel Incidental Discharge Act (VIDA).